British food used to be a punchline, but the enterprising chefs of London and have made the city a culinary destination in the past couple decades. With global influences, ethnic options that go well beyond Indian, a roaring street food scene, and rich options for high and low dining, London has something for everyone. Here are our top choices for where to eat in London now! A seasonal menu, with often more fish than meat given its Mediterranean vibe, 10 Greek Street has quickly made a name for itself out of its small Soho location. Reservations (note: called bookings in the United Kingdom) aren’t available for dinner but in order to secure a seat you can call in for lunch reservations. Surprisingly affordable for such high quality food in the center of London, 10 Greek Street won’t disappoint. This classic Camden pub is well decorated for the foodie and drinker alike. 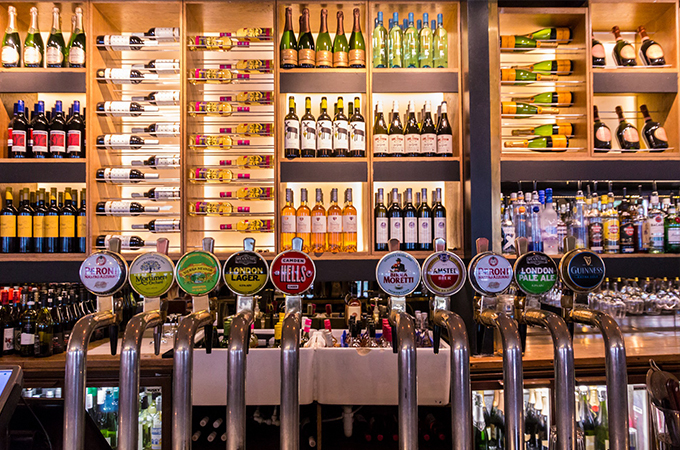 With an enormous beer garden in the back and a fine wine bar inside, the expansive menu and wide variety of specialty beers leaves nothing wanted. Daily-made pastas and breads won’t disappoint at this sleek, contemporary Italian restaurant. Food is averagely priced for high-end Italian food but be forewarned that the wine list starts at 26 GBP per bottle. Coming soon from the same owners is a pizza and ice cream place next door called Farina. This award-winning mini chain’s concept of 20 GBP for a burger, lobster, chips and salad has taken off over the last few years. Open late across the city, Burger & Lobster’s flagship location is in Soho where the atmosphere is lively and no customer leaves hungry. Some call it Australian/New Zealand cuisine, others say it is Mediterranean fusion. Either way Caravan has our mouths watering. Set in a renovated Granary Building, Caravan is known for its unique menu, own-roast coffee and global wine list. What started just a few years ago as a food truck has now expanded to 13 locations across London (and counting). Many Londoners argue Franco Manca to be the best pizza in London. Looks like you’ll just have to be the judge! Sustainably sourced Peruvian food with an upbeat energy and fresh ingredients are what you’ll find tucked inside this Soho bodega. Known for transforming traditional Peruvian dishes into high-class, delicious meals for the Soho locals, Ceviche is truly an experience. At both locations, these deil-cafes offer breakfast, brunch and lunch. With a different menu everyday the dishes change with the season and of the cheeses which have matured. Each location has its own in-store cheese room, making it difficult to walk away withut a wheel of something homemade. With six locations across London these hip cafes often have queues out their front doors. Why all the fuss? Arguably one of the few places in London to get hearty American-style breakfast food, this place attracts many expats. If you’re craving scrambled eggs and pie-sized pancakes, this is the place to eat up. Claiming to be a bacaro (“a Venetian word to describe a humble restaurant serving simple food and good, local wines”), there is hardly anything simple about Polpo’s intricate dishes. Most highly recommended comes the cuttlefish in squid ink paired with grilled fennel and white anchovy. If in search for those simpler claims, try the homemade meatballs or the mini pizzettes. Yearning for a bite of London? Check out our London Untour options here and find a vacation rental in the heart of the culinary action!